I'm not a big fan of over-hyped saturated mixes. They're fatiguing to listen to. I call it "ear burn." When used in moderation to produce the color a transformer, tube or tape, saturation can add slight warmth and loudness. Cross a fine line and overuse saturation and it breaks everything, turning the mix into an intermodulated cesspool. A few years ago I decided to try a couple of VCA-based circuits that provide a degree of control you can't get using a diode clipper. This allowed me to find what works and what doesn't. These circuits were works-in-progress: I'm posting them for posterity. The first saturator has variable threshold and ratio for instrument or mix colorization. There are two identical channels which are "coupled" using ganged controls. This looks very much like a feed-forward compressor/expander but there is no averaging of the signal. It does not respond to signal history. 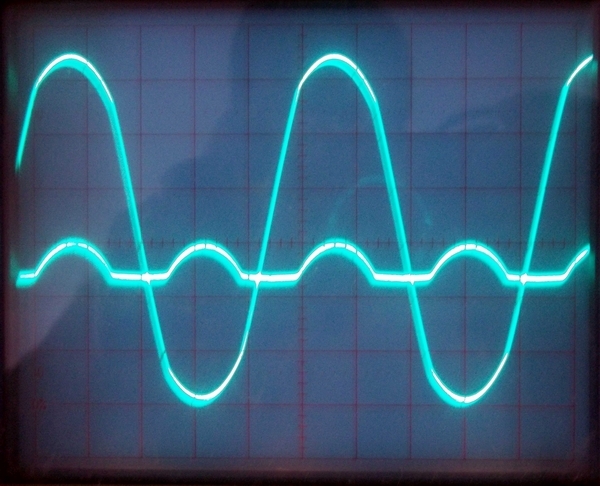 The waveform is "bent" in real-time with zero-attack zero-release. Its an amplitude modulator: The input modulates itself. Differential modulation of the VCA's Ec+ and Ec- ports greatly reduces "carrier" feedthrough. I later changed to a linear detector which made the unit a little smoother. The original used a THAT2252 log-scaled detector controlling the THAT2180 VCA's exponential control ports. That makes the overall control slope above threshold linear. The linear detector shown below causes a more rapid rise in distortion (color) near full-scale but has less effect at lower scale values which are still above threshold. The overall response is exponential. The linear detector (rectifier) is also non-switching. 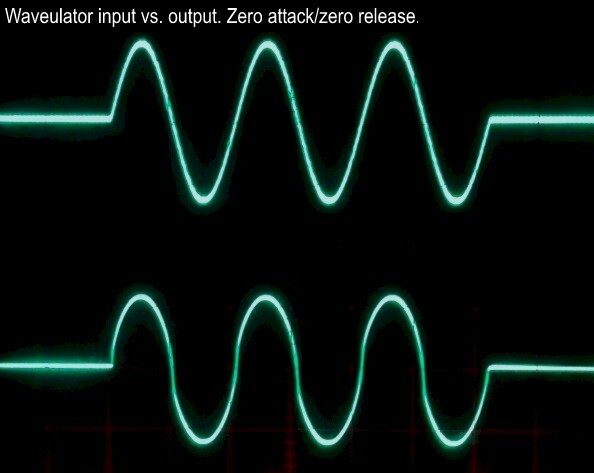 The op amps do not run open-loop at zero crossing which eliminates "hard corners" in the waveform. Hard corners anywhere sound bad. The ratio control is also slightly different: The linear version eliminated "expansion" (expansive, odd-order distortion) since it didn't prove to be a useful feature. Waveulator with a linear detector. You'll notice that the distortion is odd-order "compressive." Though it is completely at odds with musical theory I found that even-order didn't sound that good. With complex material it intermodulates more and breaks down the mix faster. The intermodulation products folded down into the mix are too dense with even order distortion. Even-order distortion on solo instruments adds a nice brightness however. Looks odd-order to me. Just like a transformer, tape head, or tape produce compressive odd-order distortion. The Waveulator guitar version using a THAT4316 and single-supply. It needs a threshold circuit. FWIW the TL072 is far quieter in this circuit for op amps A and B than the MC33178. I originally chose the '178 for its ultra-low power. Here's a demo sound file heavy on drums that had the snot compressed out of it using the Waveulator. The first pass is processed, the second unprocessed. Both are normalized to the same peak value. Note the huge increase in RMS versus peak level. The Waveulator "WMD" "Wavefront Modulation Device." Waveulator Guitar Version PC Board. I've never had much luck making distortion on purpose. Sometimes looking like it should sound better didn't deliver on that promise while listening to bench testing. While I was at Peavey, others had a lot of success using solid state to emulate tube overload (and output impedance) for use in guitar amps. There are a number of patents in that area, perhaps public domain now. In a studio delay effect I designed (late 70's/early 80s) I reduced distortion caused by a CA3080 OTA in a NR, by upgrading to the then new NE570 series companders, and a few customers remarked that they preferred the sound of the previous version. I do not know definitively that it was the OTA distortion they noticed, but that was one significant change (there were a couple others). The redesigned product remained successful, until cheap digital delay gutted that market (a pattern we would see repeat in other market sectors). So perhaps a sliver of evidence in favor of low order distortion (not to mention the numerous accolades for vacuum tube overload VS solid state). Another vote for distortion is magnetic tape saturation, in early days used as free compression for percussion tracks. Then there are the audio exciters (that would make me try to tune in my FM radio better). While designing install products that used lots of transformers in the audio path, saturation was not considered desirable, and even problematic if occurring in output transformers where amp damage could occur (I got a patent to selectively clip high level LF signals to prevent that saturation after customers applied too much bass boost). PS: I am no expert about tube saturation but as I recall from several conversations with people who were, the successful tube emulation also mimicked dynamic effects (like threshold shift during recovery from saturation). I'd wondered what had happened to this. Greg and I, along with the people who used/played with the demo all thought the Waveulator "Wavefront Modulation Device" had possibility if used in moderation. One comment we received, and it may be everyone's goal, was: "It makes my mixes sound like a record." Metering/gain makeup so that the peak level was equal in/out was the key for an accurate real-time A/B comparison of the increased RMS and perceived loudness. It wasn't a tough technical challenge to meter it: What was challenging was a good way to present the information. I lost interest in it: Greg's day job and family placed a lot of demands on him and progress was slow. I left it up to him to proceed at his pace or abandon it. After learning of Greg's untimely passing I decided that some day I should publish the work we did together. I received no compensation for it as we were both working collaboratively. Isn't the behavior of the peak of the wave a whole lot more important than the zero-crossing behavior for level indicator application? What does distortion of the rectified wave even matter here? Wayne: are you looking at that output behavior so critically because you have another purpose like a compressor level detector or something? Reading/digesting the recommended sources - I'm a big fan of Rod Elliott's site already, it was good to see the ESP logo pop up when I clicked, thanks very much! Yes, there is another purpose. In most cases the accuracy of the peak level is the most important attribute. In my application I want smooth, not hard corners, in the transition region. Sharp corners matter. Zero crossings matter if the threshold is very low. 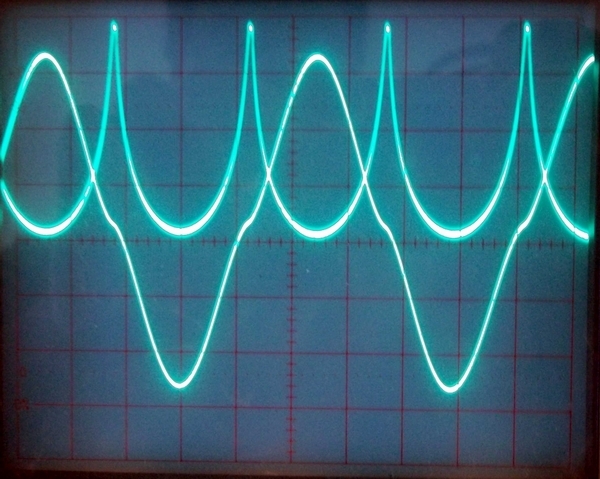 I wanted to share some of the Waveulator's "modulation" and "carrier output" waveforms using log-detector scaling. The log scaling of the detector combined with the exponential scaling of the VCA makes the combined detector transfer function, the "trajectory" above threshold, linear. Figure 1. Waveulator Full Compressive Distortion. 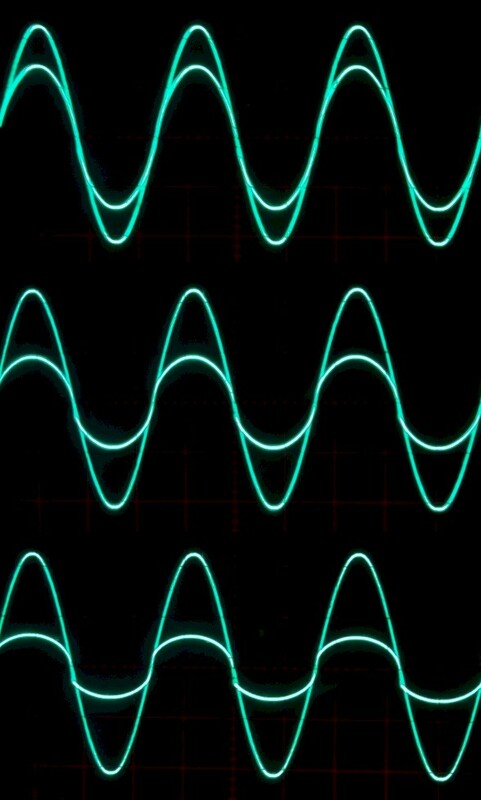 Modulation waveform is bottom. "Carrier output" is top trace. Figure 2. Mild Compressive Distortion. 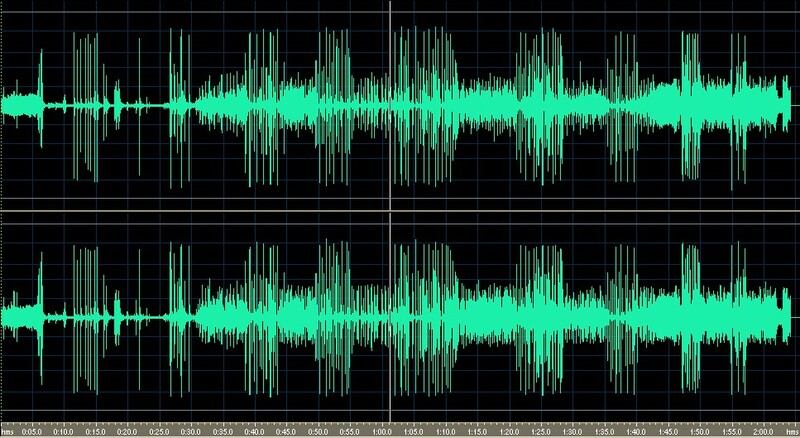 Modulation waveform is bottom. "Carrier output" is top trace. Figure 3. Soft Compressive Distortion. Modulation waveform is bottom. "Carrier output" is top trace. Figure 4. Extreme "Expansive" Distortion. 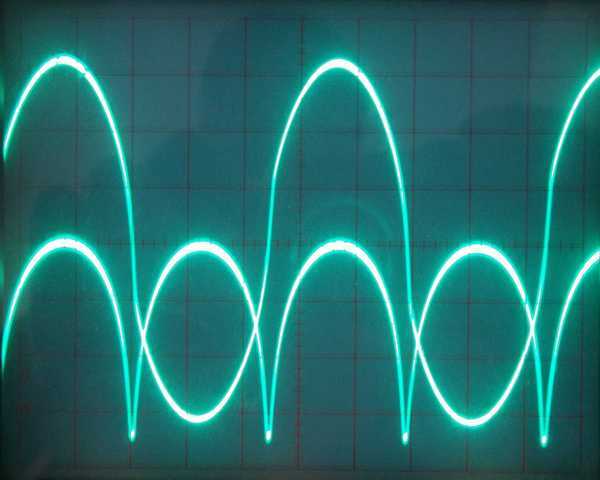 Modulation waveform is bottom. "Carrier output" is top trace. Figure 8. Power statistics for the uncompressed sound file in figure 6. 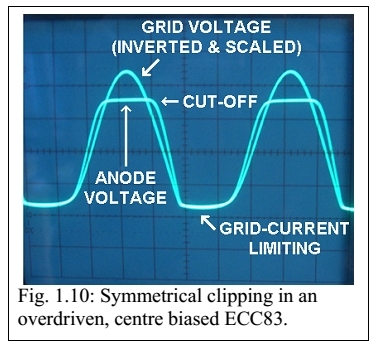 Figure 9. 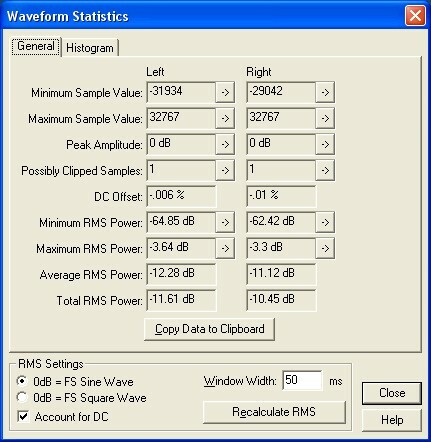 Power statistics for the compressed sound file in figure 7. Note 4 dB increase in RMS power for the same peak level. Waveulator soft-saturator detector with linear detector law, AC coupling and DC restoration. Just remembered that the AC-coupling and DC-restoration circuit following the Threshold control was a important addition. The AC-coupling (4.7µF) separates the DC component from the AC "modulation" when the threshold setting exceeds the detector level. 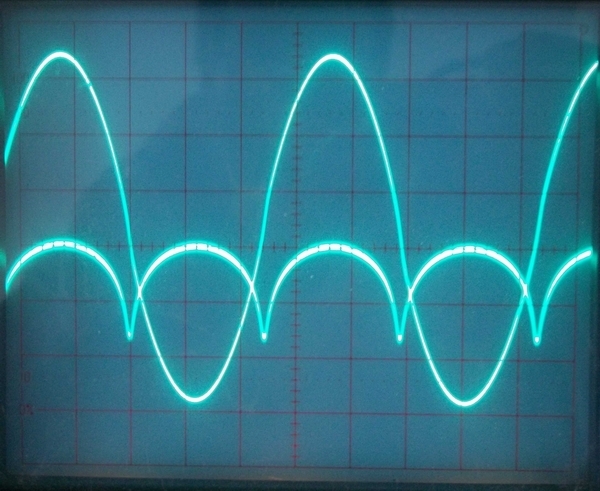 The DC restore makes the modulation pivot at a unity gain baseline. Or something like that - it's been awhile. Note also the "non-switching" full-wave "soft" rectifier. It doesn't go open-loop during any portion of the waveform. This was used to prevent hooks and sharp corners in the detected output which can sound just as nasty and hard as they look.